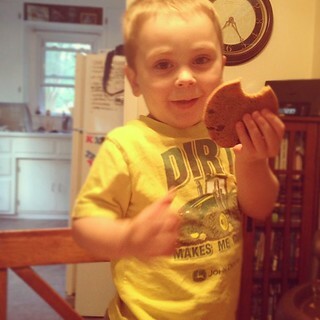 Last night Isaac had a sandwich eating contest with his Uncle Levi [there was only one gagging incident ;)], to get Isaac to eat his sandwich before becoming a whining mess over a cookie. Whoever won got the prize of a cookie. Levi's no fool and was a gracious loser, for us all. 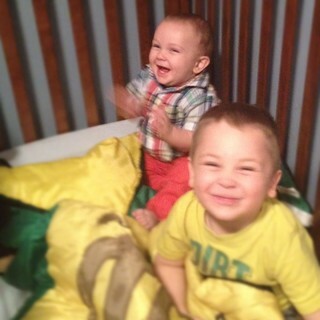 Then the brothers had some fun in Isaac's crib. Unfortunately Ezra giggles like mad when Isaac pushes him with his feet, so it's hard to get Isaac to listen when he knows it makes Ezra happy. 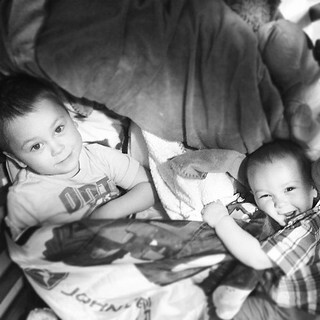 That's what's going on in the B & W and why Isaac looks so innocent. 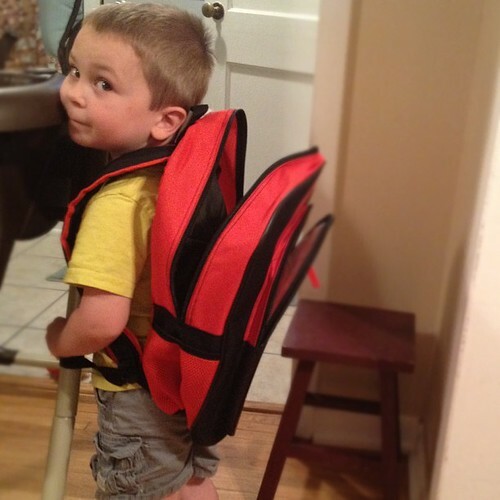 Isaac was super excited about preschool and loved to wear his "packpack" around. We had it packed with his swimsuit and towel, Cars naturally, as they are going to do outdoor water fun days when possible. I think it finally hit me when I was labeling Isaac's items that he's really going to preschool. This morning was a little rough on Isaac. Even though we discussed that he'd be waking up earlier, the wake up call didn't go over very well and obviously, I don't blame him. He absolutely clung to Tony and just wanted to cuddle while Tony was getting him ready, but we finally got him a little more perked up and by the time we got in the Jeep he was doing pretty good. Unfortunately, as we were driving I realized we might have a major roadblock, as Isaac declared "I'm going to play in the spider-man room with the castle." which the preschool we visited which he'll attend in the fall has . . . but not the summer program. I informed him we were going to a different one and thankfully he didn't fuss much, but I could tell his demeanor changed a bit as it shook his confidence to not know specifically where he was headed. As soon as he saw the playground, he perked right back up again! And then there were balloons by the welcome sign. I didn't even have to ask twice to take his picture. He was just beaming! Once we found his room, Isaac completely clammed up and wrapped both his arms around my legs, while standing behind me and basically buried his head in my thighs. There were two aides in the room and a little girl, chatting away as she ate her breakfast, and Isaac tried to ignore them completely. I pointed out the blocks, legos and fun things in the room and finally pried him off of me and led him to the table. That's when the aide asked him to sit with her and essentially picked him up and put him in her lap. When he didn't fight her at all, I quickly kissed him, told him I loved him and that Daddy would be there to pick him up and made my exit. Remarkably, neither of us cried. It's going to be different, it might be a little hard at first and it might have hiccups that you cannot predict, but you're doing the right thing for everyone. I hope he has a great day and I hope that he's excited to go back tomorrow! Will it be weekday everyday? I got choked up about you being choked up and then couldn't keep it together through the end. I'm glad that the exit was smooth and not hard for the both of you. That would've broken my heart. It will be good. He'll do great and you'll be proud! I can feel it. 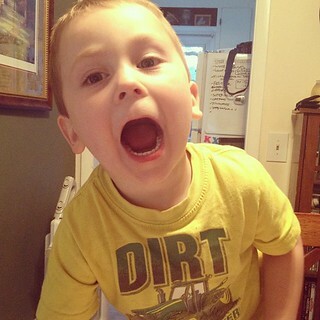 That is precious and it chokes me up and I'm not even his Mama! I pray that his first day is all that you and Tony dreamed of. Can't wait for an update! AWW! What a big boy! I can't even imagine that my little boy will be THAT BIG some day!! Insane! oh he looks so sweet with his backpack! I bet he will have so much to tell you tonight!! Oh my goodness...when did he get so BIG?! 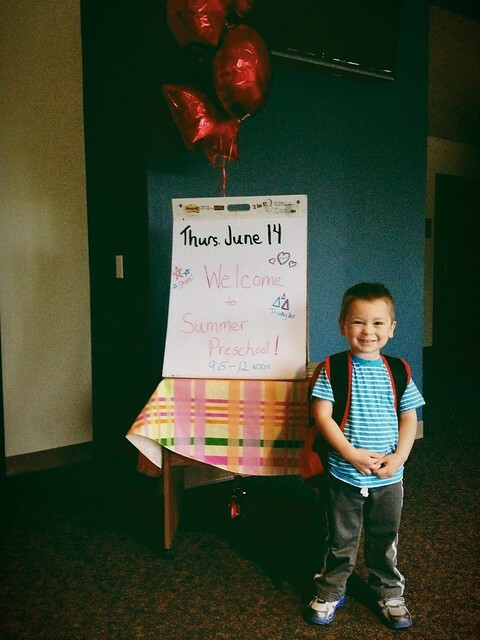 Whew, I had a pit in my stomach reading this and imagining Eli's first day of school. I will be a crying mess....and so I'm kind of jealous you have this day behind you. On a separate note, this will be great for Isaac and all of you. cannot handle this post! So cute. I just can't believe he is that big. The last picture, had me tearing up a bit. 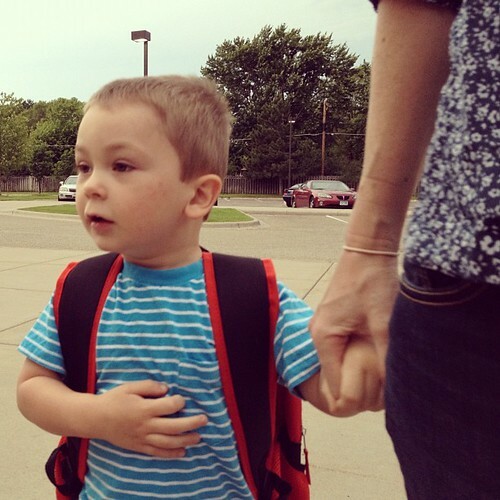 It just makes me think of my little Henry going to school soon :( Can't they slow down a bit? I am confident this is going to be a great thing for you all! Awww...how exciting and sad at the same time. I hope his first day went well! !